5 MIN WALK TO BEACH! FREE POOL. EXTRA AMENITIES. Just 21 miles from historic Charleston, Kiawah Island is nestled in semi-tropical wilderness, picturesque marshes, and ten miles of wide, unspoiled, golden beaches. Our NEWLY RENOVATED, lovely villa on the cul-de-sac in Sparrow Pond is conveniently located in West Beach Village with only a five-minute walk to the ocean, private pool, shops, restaurants, tennis courts, bike rental shop, and Cougar Point - one of the five golf courses on the island. Our family lives in Atlanta where my husband and I attended Atlanta high schools and colleges. Our three girls were all raised in Atlanta attending different colleges in Georgia. Our family has grown up visiting this beautiful island and enjoy wonderful memories . My husband proposed to me at Mingo Point in 1987 and our oldest daughter was married at the PGA clubhouse in 2012. Our children continue to spend annual vacations and holidays at Kiawah with us and now we are enjoying it with our grandchildren!! Sparrow Pond is the ideal location on Kiawah Island. You can hear the surf from our cottage but have the privacy of the woods. The culdesac is wonderful for having children play without the worry of traffic. The free (for our guests) pool is only a quick 2 minute walk and the beach is only a 5 minute walk. Very safe! toilet, combination tub/shower, 3rd bathroom right outside 3rd bedroom. Two landline phones provided. Please do not use for long distance calls without discussing with owners. Washer is in the laundry room. Laundry soap is provided. Space for 3 cars covered under the cottage. Secured Wi-fi available to renters. All towels provided. Beach towels provided too! Large combination living/dining room with roomy chairs and ottomans. Kitchen is fully stocked including an assortment of spices and every day necessities for cooking. We have an eat-in island in the kitchen with 5 chairs in addition to the dining room table with 6 chairs. Books for all ages to enjoy. Feel free to take them to the beach or if you would like, leave yours on the bookshelf for the next renters to enjoy! Beach toys available for renters to use. Hose available near storage to rinse them off for the next guests! Many children's videos are provided for your enjoyment. Rentals or guided trips available at Mingo Point. For rent. Ask owner for rental suggestions. Bohicket marina only 5 minutes away where boats can be rented or enjoyed with a captain. Fishing available! Tennis available to all our guests. Call ahead for court times. Golf available on 5 Kiawah courses to all our guests. Two minute walk to Cougar Point golf course, other 4 courses just a short car ride. Call ahead for golf tee times. Phones (with answering machine in Master), Three TVs, Cable, Two VCRs(one combination DVD player), Cooking Utensils, dishes, cookware provided, FREE community pool, Hair Dryers in all Baths, all linens and towels AND beach towels provided, SECURE internet. Place was clean and very comfortable. Plenty of room to move about. Beautiful home with everything you would need for a great week at the beach! This is such a wonderful place for a family vacation! The owner was very helpful and informative. We will definitely come back! Property is nicely furnished, had a great layout and comfortable for a family of 5. Close walk or bike to beach and extra beach chairs were a bonus! Also great was access to the pool. Owner was wonderful at communicating with us, answering our many questions and gracious in making sure our stay went well. It was so nice to have 3 bathrooms, one for each bedroom. Your place is so nicely updated. 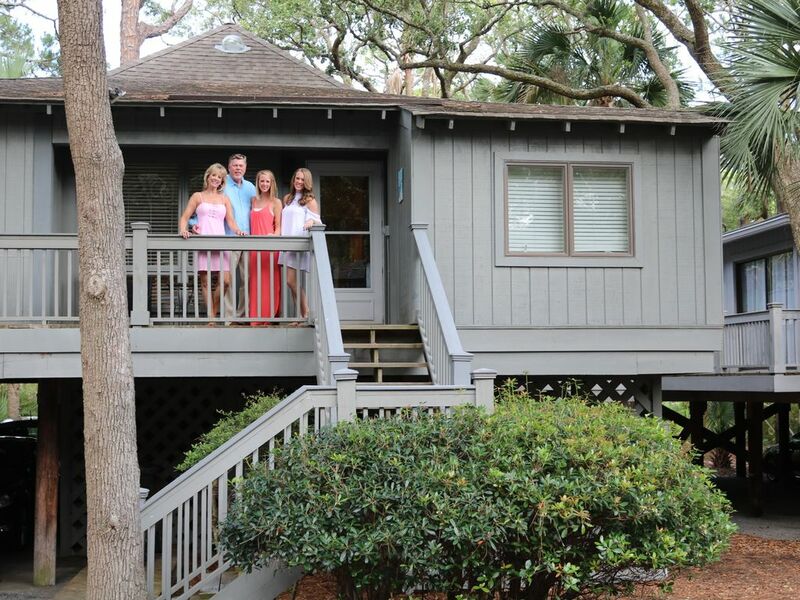 We have been visiting Kiawah for many years and have stayed in many places. We will definitely book again. Thank you! We had a great family vacation . We loved the beach and didn't want to come home. It's an easy walk to the beach - my 3 and 5 year did it every day! The house is fully equipped with everything you could need, including beach chairs, umbrella and toys. Kamp Kiawah is great for the kids too! Can't wait to go back. $300 deposit required within 1 week of receiving contract. Refundable up to 60 days prior to rental. Some exceptions apply. See contract. Weekly rates are Saturday to Saturday. Some exceptions may apply. Check with owner. Holiday weeks and special event rates may be increased. Check with owner.